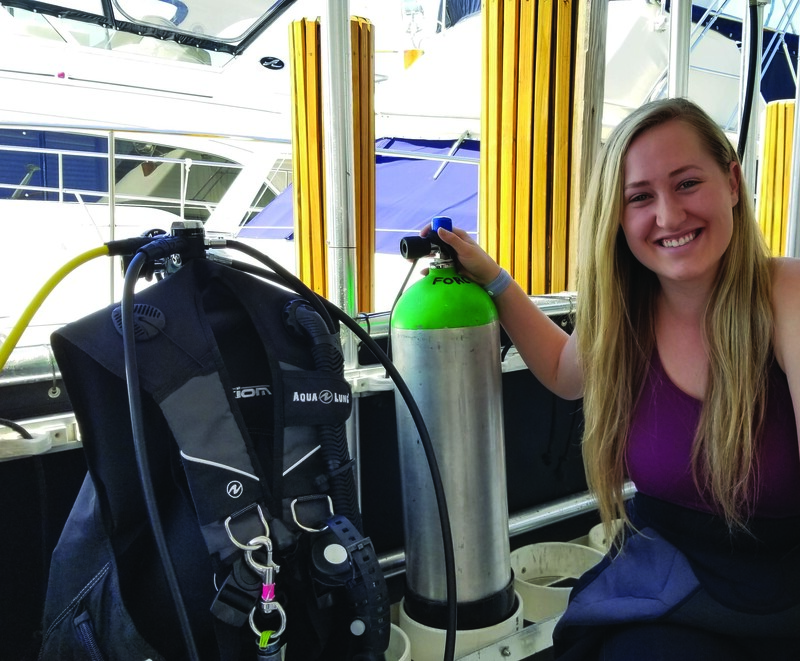 When a native Coloradoan ends up shipwrecked far from the mountains in the flats of Florida, she discovers a new passion in the blue relief of diving. We’d departed an hour ago from the Hillsboro Inlet via a small boat, skimming through the waters off Pompano Beach. After two months of training in the pool, I was finally en route to my first Open Water dive. I was familiar with personal growth through interaction with the outdoors. I grew up in Colorado, and like most mountain-born kids, I am proud of an upbringing where I spent more time in the outdoors than the indoors. In fact, I remembered my mom preaching the exact same adage when I was eight and sizing up my first fourteener. This time, instead of standing at the base of a mountain wearing hand-me-down hiking boots, I was strapped to a large steel tank with the salt water high-fiving my fins in rhythmic surges. The nausea of being a mile off coast quickly squelched my pride, and while in tandem with focusing on keeping my breakfast down, I became determined to know myself better through diving. A simple question became the focus of my ocean training: What can the water teach me? I moved to Florida when I was 18 for a college volleyball scholarship. Nothing could have prepared me for how different the buzz of South Florida was from my quiet hometown. It took me five years of living in Florida to realize that I wanted to dive. Once I had committed to it, I quickly realized that it was going to be the most intimidating thing I had gotten myself into, mainly due to the technical aspects. I spent several months training in a pool because I struggled with ear equalization. The tubes in my ears would sting with pressure every time I tried to submerge lower than six feet, and the frustration with them would only make it worse. I diligently studied the thick beginners manual, practiced ear clearing techniques, even took a yoga class. While my physical inhibitors were only a matter of time and practice, the dive planning itself was especially tricky at first. Every little part of the dive was crucial to understand and plan, and although it was a simple calculation, to a rookie it felt like rocket science. What instinctual drive leads us to seek out uncomfortable experiences? I believe mine came from growing up cradled by the mountains. All I ever dreamed about from the time I was eight and getting my first taste of fourteeners was to explore their inverse depths, but diving is an expensive and time-consuming sport. Living in Florida provided a different chance to do what I had done in the mountains. I started diving a year after I graduated school but always regretted I hadn’t started even sooner. Maybe it was the athlete in me, but with every outing I found myself longing to dive deeper, further into the blue. Perhaps in a subconscious effort to never become numb to the beauty, I often found myself daydreaming about recent dives. Diving is a dance. As my body drops below the surface, I am romanced into the allure of the sea. As my stomach settles and ears equalize, I look around me as the curtains rise for players suspended in a nautical ballet. They descend through the water, anonymous dancers donned in black suits and silver tanks, who fall from a mirrored ceiling as if strung by invisible puppet strings. There is nothing but bright, dazzling blue behind the starkness of their silhouettes. Weightless, they strike poses: one hand on their low-pressure inflator hose adjacent to their heads, the other on their diaphragm, as if inviting the water to a tango. My co-divers are no longer themselves, they are performers in what looks to be the most God-given, natural movements in the world. Once having reached the ocean floor, I am welcomed by the sea life. Martian-like coral fixtures create a forest viable enough for creatures of all sizes, from small puffer fish with neon-green-and-black speckled eyes, to 10-foot nurse sharks gliding elegantly between the coral. A green sea turtle grazes past me and I am in awe of how graceful this animal flies underwater. It feels like she is watching me. We are nodding to each other in a mutual greeting. I glance at my dive computer to check my gas and no-decompression time, each divers personal countdown to ascension. Fourty-five minutes later, John and I are on our way back up, completing our safety stop and once again sitting on the edge of the boat. As I watch the streamline left behind by our boat on the surface of the ocean, I am already planning my next trip. Want to find yourself in Florida’s warm waters? Follow this all-levels guide on where to go and who will take you there. A fantastic spot for beginners, The Nursery hosts a multitude of sea life from green sea turtles to lobster. Open water certified divers and snorkelers are bound to be greeted by the resident nurse sharks that frequent the area, many reaching 10 feet long. Wreck diving is a rush and the Lady Luck offers all the adrenaline rush you could want. Built in 1967, the 324-foot-long and 50-foot-wide tanker was recently sunk in 2016 as part of the Shipwreck Park Foundation’s effort to create more artificial reef spots outside of Pompano Beach. As part of the initiative, painter Dennis McDonald re-vamped the ship as an “underwater casino,” equipped with statues of blackjack-playing sharks, octopus card dealers, mermaid patrons and more. Advanced Open Water divers will see plenty of fish between 60 to 130 feet of depth and have a chance to swim through rooms, up ladders and (my favorite) through the windows. This a great spot for both divers and snorkelers looking for a depth range of five to 20 feet in the inlet rather than the ocean. A popular freediving area, Blue Heron Bridge is a quiet local spot to see some incredible sea life up close. There are several artificial reef structures where divers can find huge starfish, stingrays, jellyfish, angelfish and much more. Be sure to hit the park at least an hour before high tide for the best visibility. Adam, Maggie and their dog Kai, are amongst the friendliest boat captains in South Florida. With years of experience behind them, they provide a safe dive and an incredibly fun. 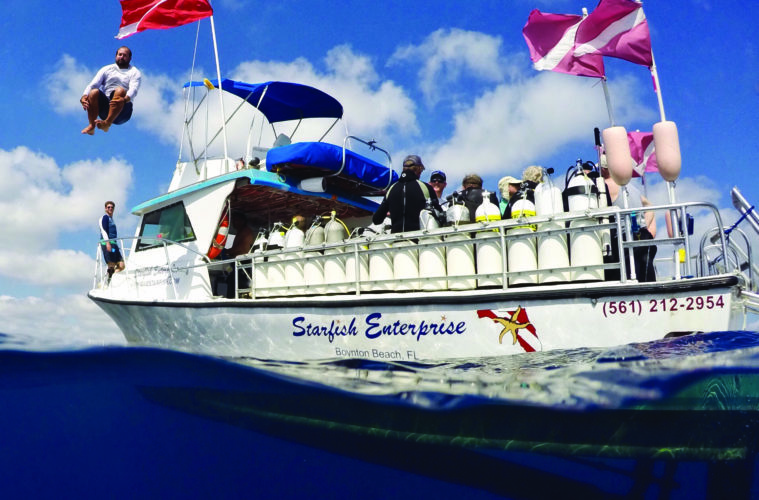 You may see them coasting through the Boynton Inlet with Bob Marley playing, smiling divers, and Kai keeping a lookout on the captain’s deck. South Florida Diving has a huge array of available dive locations, so this is a great boat to check out if you’re only in town for a short time and want to be sure you’re getting a great dive in. With an incredibly friendly staff, large dive boats and an easy-to-access location, South Florida Diving Headquarters is definitely a go-to for anyone coming from out of town.